Volume four of the all-new "Handbook of Neuropsychology" addresses the disorders of visual behaviour. This work reviews the neurophysiology of spatial vision, as well as recent work on recognition deficits for faces, objects and words. Also presented are disorders of spatial representation, of colour processing and of mental imagery. 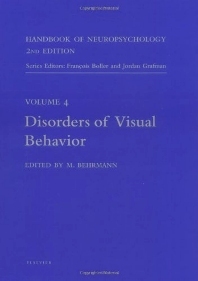 Balint's syndrome, blindsight, and visuospatial or constructional disorders are discussed and the relationship between eye movements and brain damage are described in detail.